We’d love your help. Let us know what’s wrong with this preview of Born in Tibet by Chögyam Trungpa. Chögyam Trungpa—meditation master, scholar, and artist—was identified at the age of only thirteen months as a major tulku, or reincarnation of an enlightened teacher. As the eleventh in the teaching lineage known as the Trungpa tulkus, he underwent a period of intensive training in mediation, philosophy, and fine arts, receiving full ordination as a monk in 1958 at the age Chögyam Trungpa—meditation master, scholar, and artist—was identified at the age of only thirteen months as a major tulku, or reincarnation of an enlightened teacher. As the eleventh in the teaching lineage known as the Trungpa tulkus, he underwent a period of intensive training in mediation, philosophy, and fine arts, receiving full ordination as a monk in 1958 at the age of eighteen. The following year, the Chinese Communists invaded Tibet, and the young Trungpa spent many harrowing months trekking over the Himalayas, narrowly escaping capture. To ask other readers questions about Born in Tibet, please sign up. The Tibetan issue is clouded by lies, propaganda and poor spokesmen. I became disillusioned with the Tibetan plight years ago as I slowly began to learn that the violence and injustice that characterized Chinese and Tibetan relations for decades was no more, yet the government in exile kept shouting that it was and the CCP denied that it ever was. I became disillusioned when the Dalai Lama changed his stance, going from claiming that a real genocide was taking place to a cultural one, just because Tibetan children are also taught Mandarin in the schools built by the CCP. I became disillusioned because the CCP won’t stop treating an old monk like a terrorist. That the same monk lived in luxury and dined with easily impressed Hollywood stars while Tibetans lived in poverty didn’t help either. Also, the fact that all the money he collected never went to his poor countrymen, the CCP was doing more for these people, bringing in medicine, education and food. I became disillusioned when the Central Government would whitewash whatever unfair treatment that was visited upon the Tibetans just to save face. I became disillusioned when I learned that the society the CCP altered so drastically was a feudal one that came complete with serfs forced to live under a religious oligarchy that allowed torturous corporal punishments. Because of this disillusion I stopped caring about the issue, I stopped reading the latest books to demonize the Chinese and I stopped reading the latest news brief that defended the party. Then a friend handed me this book Born In Tibet by Chogyam Trungpa, a man who lived the privileged life of an Abbot when he was forced to leave his homeland due to the Chinese invasion of Tibet. While I was concerned about reading yet another piece of propaganda I was still curious as I have never read an autobiography of these events. I had always read books written by westerners speaking for Tibetans. What I discovered was not propaganda about evil Chinese, though the author was very dismissive of them, but the view of an abbot deeply apart of his feudal religious upbringing, which made him dismissive of almost everyone. Trungpa starts his tale with the death of the abbot of Surmang, a monastery in eastern Tibet. This mans death is important for Trungpa is this abbot. He recounts the history of his soul and it’s great spiritual conquests until it comes to the abbot of Surmang. The former abbot dies in great mystic style by stating where he will be reborn and who he will be reborn to. He then assumes a mediation pose and dies like this, all mystic and holy like. His students a few years later set out for the area in which their teacher prophesied his return, which just happens to be close by, and find Trungpa. They test the young lad but there are some doubts. After a long explanation from his mother about who his father was they determine that he is their teacher reborn. The young Trungpa is taken from his family to become abbot of Surmang and the ridiculous age of five. The book drones on about his training as a child abbot which includes a lot of meditation and retreats in caves. What I did find interesting here was his view of the people around him. His mother is reduced to a servant who can’t enter the monastery, and while he has a connection to her he is more concerned with his teachers, as if being told he is the reincarnation of someone makes his mother no longer his mother. He is indifferent to a flogging carried out by a monk, only expressing the tiniest bit of sympathy. Everyone is nameless but his direct teachers, other monks, people he meets, no one means anything to him but his direct teachers. Things don’t get interesting until the Chinese show up, however, Trungpa never really meets any Chinese, but once or twice, he only hears about them. He hears that they are cleaning streets of filth, because I guess the Tibetans didn’t keep their streets clean. He hears that the PLA pays for everything and helps neighborhoods. He hears about them killing monks and that they destroy monasteries, but all he really has is other people's accounts. Maybe this explains some of his extreme disconnect from common sense. In the face of an invading army Trungpa decides to spend a great deal money on expanding the temple complex while refugees with nothing pass right by his front doors, because it is his spiritual duty. Though it takes him awhile, Trungpa eventually finds himself on the run from the Chinese. This flight from danger is no ordinary running for your life flight, however. No, there are many stops along the way to perform religious rituals and reflect on the Dharma and give talks and lessons and blessings, take in nature and have cups of tea during picnics. He travels with attendants and a bursar, who is also a monk and is concerned Trungpa will flee to India with all the gold and treasures they are carrying leaving nothing for anyone else. I could only assume that this wealth was what was collected to expand Surmang while homeless Tibetans starved outside the monastery. Meanwhile, Trungpa gives Dharma talks on not giving in to the materialistic world. Some of these rituals he engages in, which are completed with all the gold tools of trade, are so complicated that he has to explain the significance of them to the monks who just helped him perform it. There is a passage where Trungpa tells the reader how close the Chinese are to finding his group. So close are they that the party dares not light fires, but Trungpa and his monks go for leisurely walks around the campsite to engage in meditation and prayer. He even complains at one point of not having a walking area at one of the campsites. He is not very convincing at running for his life to protect the sacred teachings of the Buddha. He comes off as more of Tibetan Marie Antoinette. While Trunga will take on any traveler willing to go with him, he makes it clear he is only concerned with the other monks. These monks were all chosen for the their positions in society the same way he was, by divine reincarnation having once been an important monk in another life. They are thus keepers of the Dharma, therefore they are more important then the common refugee and their family, or lower ranking monks, which Trungpa makes very clear with his dismissive attitude towards them. These higher ranking monks essential end up being a divinely chosen ruling class looking out for themselves. The ‘importance’ of these monks to the holy order is also made clear by how many of the monks, including Trungpa began running, they sneak out. Higher ranking monks would sneak away from their students so they wouldn’t draw a crowd, leaving them to face the Chinese. It was these lower ranking monks who were shot by the PLA when they couldn’t reveal where their leaders had run off to. Trungpa is guilty of something similar. He is never willing to abandon monks, but will sneak away from refugees, again to make sure a large crowd doesn’t follow him and his monks. Even though Trungpa disconnects himself to the refugees they follow him all the same as best they can, blindly and religiously loyal. There is a little bit of worry for Trungpa’s fleeing group when they get lost in the mountains. The monks and the refugees following Trungpa run out of food and face the harrowing conditions of nature. The ultimate wisdom that guides them through these harsh conditions is Trungpa and his divining tools. Yep, divine gambling decides which path they take. Trunga asks the heavens which way they should go and rolls his holy twelve sided die. It is amazing that any of them survived. At the end they reach the Indian border and safety with only losing one old man, who Trungpa can’t be bothered naming, he wasn’t a monk anyway. Contents aside there are problems with the text as well. Trungpa writes in run on sentences, long ones. He usually starts with a point and after several comas comes back to the same point. He writes paragraphs that take up whole pages and communicate matter of little importance. There are several typos and incorrect information, like in the forward, which states Qing Dynasty fell in 1912, when it was really 1911. Long winded, rambling and repetitive is the style of writing Trunga showcases. Trungpa became very famous later in his life in the west as teacher of Tibetan Buddhism for the westerners who were apart of the Flower Power Counter Cultural Revolutions, a.k.a. Hippies. During this time he gives up the monkhood and takes to sleeping with his students and marrying a wealthy sixteen year old British girl when he was thirty. He eventually dies due an alcohol related illness, because he was a raging alcoholic, but is still revered as a holy man. While the book does not cover that part of his life and paints a different picture of him then what he became, it is still not very flattering. At the end of the book I am not sure how this title gained any sympathy for the Tibetan cause. I am sure that other monks were not like Trungpa, but having him as a spokesperson for Tibet in general strikes me as a bad idea. Born in Tibet is the story of Chögyam Trungpa’s early life in Tibet. He was a year old when some monks turned up and announced he was the eleventh Trungpa Tulku and hence the supreme abbot of the Surmang monasteries in eastern Tibet; at twenty he managed to escape the Chinese occupation and make his way to India. So the book really has three main subjects: his traditional religious education, the increasing impact of the Chinese on Tibetan life, and the adventure/survival story of escaping cross- Born in Tibet is the story of Chögyam Trungpa’s early life in Tibet. He was a year old when some monks turned up and announced he was the eleventh Trungpa Tulku and hence the supreme abbot of the Surmang monasteries in eastern Tibet; at twenty he managed to escape the Chinese occupation and make his way to India. So the book really has three main subjects: his traditional religious education, the increasing impact of the Chinese on Tibetan life, and the adventure/survival story of escaping cross-country into India. The escape is remarkable, since it involves dozens of people trying to secretly cross some of the most difficult terrain in the world; but the portrayal of traditional life in a Tibetan monastery is what interested me most. It is slightly ironic that many westerners treat Buddhism as a kind of antidote to organised religion, because this was organised, institutional religion on the grand scale: an elaborate formal hierarchy, large, expensively appointed buildings with hundreds of people, elaborate rituals, explicitly supernatural practices like divination, all supported by large scale land ownership and tributes offered by the local population. It’s rather how I imagine the middle ages in Europe must have been: a basically peasant population loomed over both by the houses of feudal aristocrats and by the abbeys and monasteries of the great religious orders. The fact that comparison sounds like a criticism says something about the glowing image of Tibetan buddhism — mainly I guess down to the personal qualities of the current Dalai Lama — and the bad image of medieval Catholicism. The reasons for which are more tangled, although the largely Protestant history of the English speaking world is clearly relevant. Personally I have a soft spot for medieval monasticism; and my scepticism about human nature means I bet were a few Tibetan monks over the centuries who were, let’s say, more worldly than they should have been. Though it has to be said that Chögyam Trungpa was not living the life of a Medici pope. His life in Tibet seems to have been austerely lived and completely devoted to spiritual practice. The childhood in particular sounds tough; being taken away to a monastery at three and spending pretty much all his time from then on in study and devotion. Anyway, it is fascinating stuff. Our travelling party was organized with a good deal of pomp. There were thirty monks on horseback and eighty mules to carry the baggage. I was still only twelve and, being so young, I was not expected to preach long sermons; mostly I had to perform rites, read the scriptures aloud, and impart blessings. We started from the highlands and traveled down to the cultivated land; I was able to see how all these different people lived as we passed through many changes of scenery. Of course I did not see the villagers quite as they were in their everyday lives, for wherever we went all was in festival, everyone was excited and looking forward to the special religious services, so that we had little time for rest. I missed the routine of my early life, but found it all very exciting. 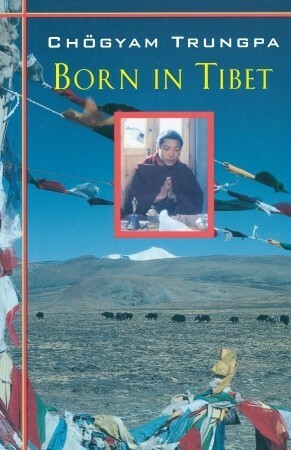 Born in Tibet is my book from Tibet for the Read The World challenge. Chögyam Trungpa wasn’t actually born in what is now the Tibet Autonomous Region; when the Chinese took over Tibet, large chunks which were culturally Tibetan were assigned to different provinces. We ourselves always considered that the people who speak Tibetan and ate roasted barley (tsampa) as their staple food are Tibetans. I was sorely disappointed in this book – it shifted my perception of Buddhism in a way I wish it hadn’t. The journey the man did to escape from the Chines invasion of Tibet could have been interesting. It’s a bloody long way to India via all those mountains, and that a group of people managed it is amazing. But the drone of the story-telling made me not really care after a while. I kept hoping they would run out of leather to boil or eat their actual last bit of food and expire. I lost count of h I was sorely disappointed in this book – it shifted my perception of Buddhism in a way I wish it hadn’t. The journey the man did to escape from the Chines invasion of Tibet could have been interesting. It’s a bloody long way to India via all those mountains, and that a group of people managed it is amazing. But the drone of the story-telling made me not really care after a while. I kept hoping they would run out of leather to boil or eat their actual last bit of food and expire. I lost count of how many times they ran out of food only to have more in the next chapter. But worse than the boring telling of what could and should have been a fabulous tale of survival were the aspects of Buddhism I saw and did not like. The author is the reincarnation of someone or the other, as it seems is almost everyone in Tibetan Buddhism. As such he is treated close to royalty from when he is a little boy. Snag 1 – isn’t Buddhism essentially supposed to be non-hierarchical? He is surrounded by people there only to look after him. Hmmm – that doesn’t sit happily with me. During the escape the monks have to ditch their monkly attire and wear normal clothing so as to be less conspicuous. The authors talks about how very distressed the monks are at having to do this – they feel lost and discombobulated (my word, not his) out of their robes. Snag 2 – what happened to the non-attachment lesson of Buddhism? Then during the escape a horse falls off a ravine and the authors comment is that none of the goods the horse was carrying could be retrieved. Sang 3 – a being died and the Buddhist was worried abut his belongings – really? Hmmm – nope, doesn’t work for me. The author was not likeable much – the only time his personality ever showed was when he was laying down the law with all the people following him. And he kept buggering off to do a retreat while those following him were starving and freezing. Maybe my escaped catholic roots expect a little more from a religious or spiritual leader. I have since spoken to a Buddhist friend of mine and apparently this kind of things is a little typical of Tibetan Buddhism – and Tibet Buddhism is a very specific strand of the believe system. Phew – cos I like the idea that I aspire to be a Buddhist – I’d have hated to lose all that cos of one monk. Fascinating story. I study Shambhala Buddhism which is the lineage started by Chogyam Trungpa. This book is his biography from birth until about age 20 when he escaped with other monks from Tibet to India. It is a harrowing and heartbreaking story. It was very interesting to read about life in Tibet pre-China. They sound like a very simple, spiritual people. The escape sounded intense. Glad to have read this story. Amazing story! It's fascinating to read of this kind of escape in the first person. The epilogue in this 1971 edition seems a little sad, which makes sense given the psychological trauma of having to leave your home and start over in a different world. Also, reading about his post-Tibet life, it seems the trauma of escape had some long-lasting ramifications. Thoroughly enjoyed this book. It gave me a context for how Buddhism was first brought to the United snakes that I didn't understand, and am only beginning to understand. Great read. It didn't get a 5 because I only give 5s to a book that I would read twice. Excellent biography of sorts, the details gives one sufficient mental space to imagine oneself in their journey and struggles during their escape from tibet. This is a somewhat long and quite difficult read but also a very interesting look at pre-Chinese occupation of Tibet from the inside out. It is also written from the perspective of a privileged class and because of that there are certain difficulties faced as a reader. It is hard a lot of the time to be sympathetic to the narrator and there are certain events which are hard to swallow. A silly example that got to me: about four times he quotes accounts where the Chinese force the servants and ma This is a somewhat long and quite difficult read but also a very interesting look at pre-Chinese occupation of Tibet from the inside out. It is also written from the perspective of a privileged class and because of that there are certain difficulties faced as a reader. It is hard a lot of the time to be sympathetic to the narrator and there are certain events which are hard to swallow. A silly example that got to me: about four times he quotes accounts where the Chinese force the servants and masters of 'liberated' villages to swap clothes as a show of humiliation. I don't know why this irritated me so much, perhaps because he sandwiches this in between actual atrocities so often as though they were of equal standing. It's as though the power relations between monks and laypeople and masters and serfs are seen almost as holy as the dharma itself. That said I am glad it is told in the way it is and although it is difficult I believe it is also important that the author basically does not sugar coat anything. It makes the whole thing very authentic and I love the fact that I can read this thing and see a real human being in front of me complete with foibles and ego and attachments and needs. We are not presented here with a monk free of stain, we are presented with something much more valuable. As alien as that society may have been to Western readers it is presented here bare; laid out and broken apart and brilliant. This was a very unique autobiography focused on the author's life from birth in Tibet through his escape across the Himalayan mountains and into India during China's invasion of Tibet. In addition to being eye-opening in regards to that region of the world during that period in history, it was similarly eye-opening regarding Tibetan buddhism and a way of life non-existent anywhere else in the world. The destruction that communism wraught on a peaceful country was disheartening while the Tibetan This was a very unique autobiography focused on the author's life from birth in Tibet through his escape across the Himalayan mountains and into India during China's invasion of Tibet. In addition to being eye-opening in regards to that region of the world during that period in history, it was similarly eye-opening regarding Tibetan buddhism and a way of life non-existent anywhere else in the world. This was an astounding work that informs the reader of the the Tibetan peoples before the Chinese occupation and of the upbringing of a Tibetan tulka (incarnation of a previous-lived Tibetan holy man). From his birth to his coronation to his flee from Chinese Communists capture and possible death, I read in rapt wonder that all this happened in so short a time. After reading this book, I am compelled to read more by the author and recommend it to those interested in a greater understanding of Bu This was an astounding work that informs the reader of the the Tibetan peoples before the Chinese occupation and of the upbringing of a Tibetan tulka (incarnation of a previous-lived Tibetan holy man). From his birth to his coronation to his flee from Chinese Communists capture and possible death, I read in rapt wonder that all this happened in so short a time. A fascinating glimpse into monastic life in Tibet before the communist Chinese takeover. Trungpa's evocative style is not meant to be always taken literally. In other words, there are hidden teachings here. As well, we can only see the life from the point of view of privilege; other more ordinary lives are almost invisible in this text. Nonetheless, a classic text from a modern master (and trickster). This unique book gave me an insider view of the achievements of Tibetan culture and of its downfall amidst the Chinese occupation. It is also a fascinating glimpse inside the head of one of the great spiritual masters of our times. A vivid depiction of monastic life in Tibet, and of the hardship brought by the Communist invasion. He practices non-violence during Chinese persecution at a young age. An interesting read, I did find it a bit dry at times but also some great insights. I didn't enjoy the read. I thought I would, but didn't. This is one of the best books I've read in the last two years. A great journey! Vidyadhara Chögyam Trungpa Rinpoche (Tibetan: ཆོས་ རྒྱམ་ དྲུང་པ་ Wylie: Chos rgyam Drung pa; also known as Dorje Dradul of Mukpo, Surmang Trungpa, after his monastery, or Chökyi Gyatso, of which Chögyam is an abbreviation) was a Buddhist meditation master, scholar, teacher, poet, and artist. He was the 11th descendent in the line of Trungpa tulkus of the Kagyü school of Tibetan Buddhism. He was al Vidyadhara Chögyam Trungpa Rinpoche (Tibetan: ཆོས་ རྒྱམ་ དྲུང་པ་ Wylie: Chos rgyam Drung pa; also known as Dorje Dradul of Mukpo, Surmang Trungpa, after his monastery, or Chökyi Gyatso, of which Chögyam is an abbreviation) was a Buddhist meditation master, scholar, teacher, poet, and artist. He was the 11th descendent in the line of Trungpa tulkus of the Kagyü school of Tibetan Buddhism. He was also trained in the Nyingma tradition, the oldest of the four schools, and was an adherent of the rimay or "non-sectarian" movement within Tibetan Buddhism, which aspired to bring together and make available all the valuable teachings of the different schools, free of sectarian rivalry. Trungpa was a significant figure in the dissemination of Tibetan Buddhism to the West, founding Naropa University and establishing the Shambhala Training method, a presentation of the Buddhadharma largely devoid of ethnic trappings. In 1963, he moved to England to study comparative religion, philosophy, and fine arts at Oxford University. During this time, he also studied Japanese flower arranging and received an instructors degree from the Sogetsu school of ikebana. In 1967, he moved to Scotland, where he founded the Samye Ling meditation centre. Shortly thereafter, a variety of experiences—including a car accident that left him partially paralyzed on the left side of his body—led him to give up his monastic vows and work as a lay teacher. In 1969, he published Meditation in Action , the first of fourteen books on the spiritual path published during his lifetime. The following year he married Diana Pybus and moved to the United States, where he established his first North American meditation centre, Tail of the Tiger (now known as Karmê-Chöling) in Barnet, Vermont.